By Antolin Garcia Carbonell, R.A. If Floridians share a common trait, it is how we promptly forget the past once something new comes along. Case in point: Vivian Laramore Rader, who was Florida’s Poet Laureate from 1931 till her death in 1975. Until the last years of her life, she was a teacher, poet, and cultural driving force in Florida. Laramore Rader not only had literary talent but also the ability to recognize it and nurture it in others. Thirty years after her death, very few people even recognize her name. The Laramore-Rader Poetry Group that started meeting in her house on Wednesday mornings in 1931 continued for 60 years and its spirit lives on in the Hannah Kahn Poetry Foundation. Although rigid in her adherence to traditional rhyme, meter and forms, and wary of the confessional and experimental poetry of the fifties, she encouraged new talent to grow in the collegial and cooperative environment of her classes. Born in Saint Louis, Missouri on November 16, 1892, Vivian K. Yeiser was the daughter of William and Carrie Blaine Yeiser. Her father, a native of Rome, Georgia, attended medical school, but worked as a druggist at Dr. McRae’s Drug Store in Sanford, Florida. After his first wife, the former Alice Vivian Shearer of New Orleans, died, he married Carrie Blaine, who had moved down to Sanford from Ohio. It is striking that Carrie Blaine agreed to name Vivian after her husband’s first wife. In her later years, Laramore Rader drew a veil over the next decade of her life. In 1909, William Yeiser died, and Carrie and Vivian Yeiser had to make their way alone since Charles, William’s son, was living with his wife and children in Panama where he worked for the canal administration. In April 1912, Vivian married Robert Eugene Laramore, a traveling salesman, and, like her father, a Rome, Georgia native. By 1918 she had given birth to and lost two infant sons. Looking for new opportunities, Robert Laramore settled in Miami in 1916 and became involved with land development and building construction just as the Florida Land Boom got underway. His wife joined him in 1920, after attending a poetry workshop by future Poetry Pulitzer Prize winner Eleanora Speyer at Columbia University. And thrown the key away! Nevertheless, it was not all sentimentality, a definite spark of rebellion appears in “The Woman by His Side,” her take on living in Robert Laramore’s shadow. By 1924, with her first published collection, titled Poems, she found her place in Miami’s social and cultural scene, befriending such local luminaries as Stella Tuttle, Miami founder Julia Tuttle’s daughter-in-law, and aviator Glenn Curtiss and his mother, Mrs. Lua Curtiss. Another friend, soon turned collaborator, was the composer Manna Zucca.3 A former child prodigy with an extensive performing career, she had a winter home near the Laramores in North East Miami. Manna Zucca set music to Vivian Laramore’s “My Florida” and opened the way for an extensive career as a lyricist that eventually encompassed 30 songs. At least 10 of these song lyrics were written in collaboration with another musical neighbor, Olive Dungan Pullen,4 the wife of Miami businessman, Claude Pullen. A second collection, Green Acres, was published just as the Florida Land Boom crashed with the September 1926 Great Miami Hurricane. A growing interest in South Florida’s tropical environment is evident in poems such as “Mango Tree,” “Bougainvillea” and “To a Red Hibiscus” and readers gain a rare insight into her early life in “My Mother Was a Dancer.” Ostensibly about a dead mother (Carrie Blaine was very much alive at the time), the poem is mostly about a dead father who “… was a scholar/ his hands were thin and white…” and who “…died by choice/ his body washed ashore/ told me that a scholar/ had probed another door” raising questions in the reader’s mind about William Yeiser’s death at age 50. As the Florida Land Boom crashed, ending his career, Robert Laramore was diagnosed with a chronic illness. After the 1929 Stock Market Crash, Vivian Laramore sought ways of making a living from her writing, gradually becoming the main financial support of the household. By 1930 she had started the Wednesday morning meetings of the Laramore Poetry Group at her home on North East 35th Street. One of the first speakers invited to address the group was naturalist and writer, Charles Torrey Simpson,5 a North East Miami neighbor who lived on a nine acre tropical preserve just 30 blocks up the newly finished Biscayne Boulevard. Mr. Simpson had been instrumental in discovering and promoting South Florida’s tropical environment and his private preserve was Miami’s first Botanical Garden. 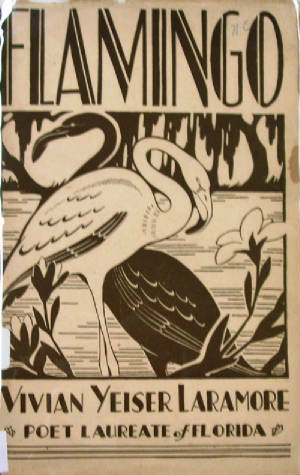 Simpson’s influence is evident in Flamingo, Laramore’s next book of poems, published in 1932. She celebrates Florida as home, a place that includes mangroves and the Tamiami Trail crossing the Everglades, a refreshing response to outsiders’ take on the peninsula as either an exotic locale or one lacking in poetic qualities. This collection also includes “On Having and Had,” ostensibly about a woman who has lost a son in France during World War I; it gives a voice to her own loss. In the spring of 1931, Franklin N. Wood, Florida’s first Poet Laureate, died, and it fell to Florida Governor Doyle E. Carlton to appoint a replacement. How Mrs. Laramore was selected is the subject of on-going research, but on October 13, 1931 she received the official notice. This official recognition gave her career an important boost and by December 1931 she had started publishing every Sunday in the Miami Daily News her column Miami Muse, where she featured the work of 780 local or visiting poets over the next 15 years. A preliminary look at the index of authors in the anthologies she published between 1932 and 1941 finds Robert Frost, Chilean Nobel Prize winner Gabriela Mistral and Du Bose Hayward, author of Porgy and Bess. It is also remarkable that at a time when even Miami’s telephone directories were racially segregated, these anthologies included the work of African-American poets such as Alpheus Butler. 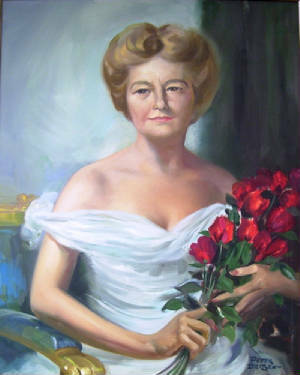 Vivian Laramore Rader, 1948, Miami News Collection of the Historical Museum of South Florida. In 1936 Robert Laramore died after a ten-year chronic illness. Freed from tending an invalid, the widowed Vivian Laramore accepted the offer from Rollins College Vice-President Dr. Grover to conduct a poetry class at their summer school in Blowing Rock, North Carolina. This in turn led to an invitation from Evelyn Grace Haynes in 1939 to teach at the Huckleberry Mountain Artist’s Colony outside Hendersonville, North Carolina, modeled on the Mac Dowell Colony in Peterboro, New Hampshire.6 She returned every summer until 1955. During this decade of professional success and personal pain she met Hannah Kahn, a life-long friend and most distinguished student, who named her daughter after the Poet Laureate. Hannah Kahn had a successful career as a much published poet, mother of 3 children and an interior designer, before becoming the Miami Herald’s Poetry Editor in the early 1950’s. Her son, Judge Dan Kahn,7 recalls fondly his mother’s friendship with the Poet Laureate, confirming the image left in numerous published interviews and thumbnail sketches of a warm, gracious lady. In her 1939 book, Had Sappho Written Sonnets, while Laramore‘s focus returns to poetic form, she celebrates her Florida roots in the joys of Christmas in a warm climate, “Beneath a Southern Sky.” Later set to music by Composer Gladys Rich8 it enjoyed success as the first “Southern Carol.” She further explored this religious Christmas theme in her book length poem The Beggar and the Star (1949), while The Ballad of the Silver Flute (1940) is a tribute to Sidney Lanier. In Miami, she met Paul C. Rader, a civil engineer from a prominent Miami family, who became her second husband in 1946. They married at Huckleberry Mountain, with a later reception in Miami. 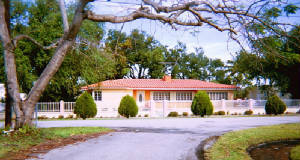 In 1949 the Raders built a delightful ranch house oriented to catch the prevailing south east breezes in Miami’s Shorecrest neighborhood. They planted a Poinciana so she could see it from the living room window. “There, with the windows open to let in bird song and flower smells, Laramore Rader taught 15 students until a few years before she died in 1975.”9 During the next 20 years, she published two additional books: Poinciana Poems in 1953, a beautifully crafted collection of 22 of her Poinciana poems and Ode to Life in 1967, her final collection of 85 new and selected poems. In the sixties she taught classes in poetry writing at Barry College and along with Hannah Kahn and Jordan Davidson organized Annual Poetry Competition Festivals in Downtown Miami’s Bayfront Park. In her final years, Frank Fitzgerald-Bush, a distant cousin of the Curtiss family who had known Laramore Rader as a child, became her devoted student and confidant. Together they published a textbook of Laramore Rader’s poetry writing techniques stressing the importance of traditional rhyme, meter and poetic forms. This approach was at odds with prevailing tastes in the world of poetry, and Laramore Rader’s work was dismissed as old fashioned. By the early 70’s both Paul and Vivian Laramore Rader had become incapacitated and Earle Rader, Paul’s brother, became their legal guardian. After Laramore Rader’s death in 1975, Mr. Fitzgerald-Bush continued the Laramore Rader Poetry Group, holding regular workshops at the Brockway Memorial Library in Miami Shores, where Peter Driben’s10 portrait of the Poet Laureate is on display, and publishing annual anthologies for several years. In 1991, faced with declining membership and Mr. Fitzgerald-Bush’s health problems, the group disbanded. 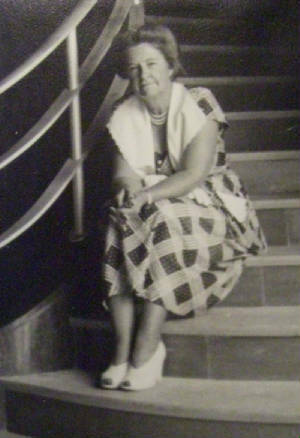 Vivian Rader at Library Stairs circa 1952, Miami Dade Public Library. Photo attributed to Helga Eason. Rader house, May 2007. Photo, Antolin Garcia Carbonell. The house the Raders built still stands at 8260 East Dixie Highway. The white wicker chairs and her blue Persian cat, Bonnie Blue, are long gone, as well as the many shrubs and flowers that Mrs. Rader loved, but the house is still surrounded by mangoes, oaks, and Poincianas, a tree she celebrated in 54 poems. With the recently completed reconstruction of Biscayne Boulevard (U.S.1) a renaissance of North East Miami’s neighborhoods is underway. Portions of Shorecrest and Biscayne Boulevard have been designated historic districts and various civic and neighborhood groups, among them the MiMo Biscayne Boulevard Association, are working with local government to make the area an exciting cultural destination with many new restaurants and shops. Yet few who live here know anything about the woman who was Poet Laureate. The time has come to re-evaluate Vivian Laramore Rader’s legacy. She attained, and kept for 44 years, a high-visibility honorary state government position at a time when few women had such opportunities. She pioneered teaching poetry writing techniques and validated the use of Florida’s tropical imagery as something more than exotic color. Well into her 70’s she was still the driving force behind Miami’s annual Poetry Festivals. In 2006, the University of Florida’s Subtropics Magazine published three of Mrs. Rader’s poems, and Marianne Kunkel of Gainesville is working on a projected anthology of her writing. Her neighbors in North East Miami are trying to preserve her legacy. It is the intent of this article to ensure the second look gets underway. A forty-seven year resident of North East Miami, Antolín García Carbonell, a registered architect with professional degrees from the University of Florida and the University of Miami spent 30 years managing design and construction projects for the Miami-Dade Aviation Department. In 2002, while researching historical structures at Opa-locka Airport he became fascinated with aviator Glenn Curtiss. Further research on Curtiss uncovered the aviator’s friendship with the Poet Laureate and the discovery that a certain house on East Dixie Highway that reminded a newly arrived Cuban refugee family of their lost home in Havana was the residence of Vivian Laramore Rader. A shared passion for Poincianas made this article inevitable. Foreword to Ode to Life Hurricane House Publishers, Inc. Miami, Florida. Miami Herald, March 25, 1966 interview with Charles Whited. Mana-Zucca Cassel (1891-1981), the former Augusta Zuckerman, was a child prodigy who composed two operas, a ballet, several orchestral works, chamber music and a collection of 366 piano pieces called “My Musical Calendar”. She was married to Irwin M. Cassel and was a winter resident of Miami since the 1920’s. New York Times Obituary, March 11, 1981. 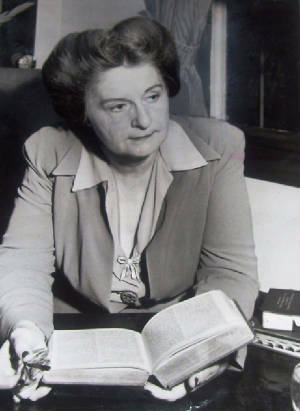 Olive Dungan (Pullen) (1904-1997) was a composer of piano and vocal works, mostly on religious themes. Charles Torrey Simpson (1846-1932), shell specialist and naturalist, known for his documentation of the South Florida tropical environment. Author of the influential 1926 book, Ornamental Gardening in Florida, he moved to Miami in 1903 and was an early advocate for the creation of Everglades National Park. Preserving the “Peterboro of the South”: Huckleberry Mountain Workshop Camp and Artists’ Colony by RoAnn M. Bishop, Carolina Comments, Volume 54, No. 1, January 2006. Conversation between author and Judge Kahn, June, 2007. Gladys Rich (1904-1994) American composer best known for her “American Lullaby” published in 1932. Peter Driben (1903-1968) American Painter who created publicity artwork for the movie The Maltese Falcon but is best known for his prolific production between the 1930’s and 1950’s of pin-up girl artwork for men’s magazines. After moving to Miami in 1958 he painted portraits of numerous local public figures including Miami Mayor, Robert King High.